Greetings on behalf of the Omega Psi Phi Fraternity, Inc., Sigma Mu Mu Chapter Quette Planning Committee! 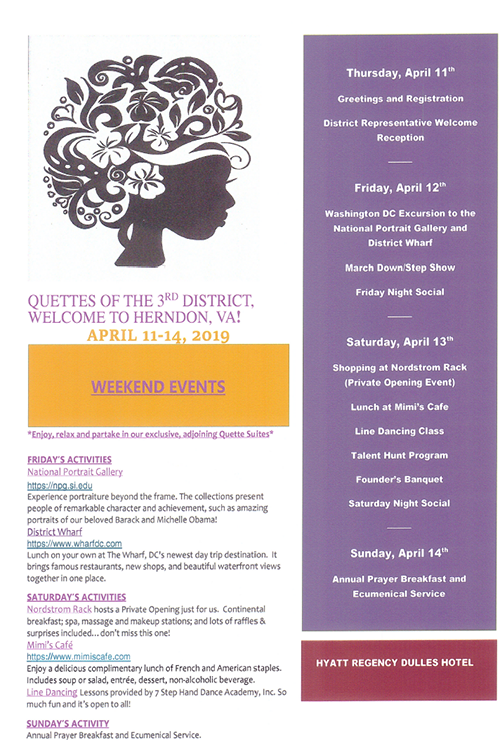 It is with excitement and anticipation that I reach out to you regarding the upcoming Omega Third District Meeting in northern VA.  Our committee looks forward to hosting the Quettes from April 11-14, 2019 at the Hyatt Regency Dulles Hotel in Herndon, VA. Please share this information as well as the attachments with your significant others. If your ladies have not yet registered, we hope that they will, and encourage them to do so as soon as possible; this will allow us to better estimate the expected headcount and plan accordingly. An exciting Quette agenda is planned which includes a Washington, D.C. excursion and a Nordstrom Rack Private Opening, among other fun activities. Please take a moment to view the attachments for activity highlights and a complete agenda. The ladies should make reservations now - they won’t want to miss out! I'm happy to answer any questions so don't hesitate to ask by contacting me at jhnsns20@aol.com.